This is a 4-day self-discovery and personal development training suitable for people who want to start a purposeful life and meaningful work experience in the UK. The programme helps participants find the motivation, clarity, tools, confidence, support and develop the skills they need to integrate into their host community and start making a positive difference in their life and the world by doing work they are passionate about. Manage the day to day stress through learning about certain body exercises, breathing techniques, food impact and creating a lifestyle and investing in a mindset that can make life a bit easier. The 5-day traninig above runs exclusively under our Integr8 Programme. That said, creative collaboration is in the heart of our values; hence we take pleasure in working with other refugee-support agencies around the UK to customise our programmes to meet their specific needs. Please visit this link and explore our range of adaptable options. This 1-day workshop is suitable for people who want to learnt about the British culture and how to adapt positivly to living and working in the UK. Regular proof-reading text for our website, reports, funding application forms, newsletter, trainings or social media posts. Below is a list of our most popular programmes that we deliver in collaboration with our peer organisations in London, Bristol and Exeter. 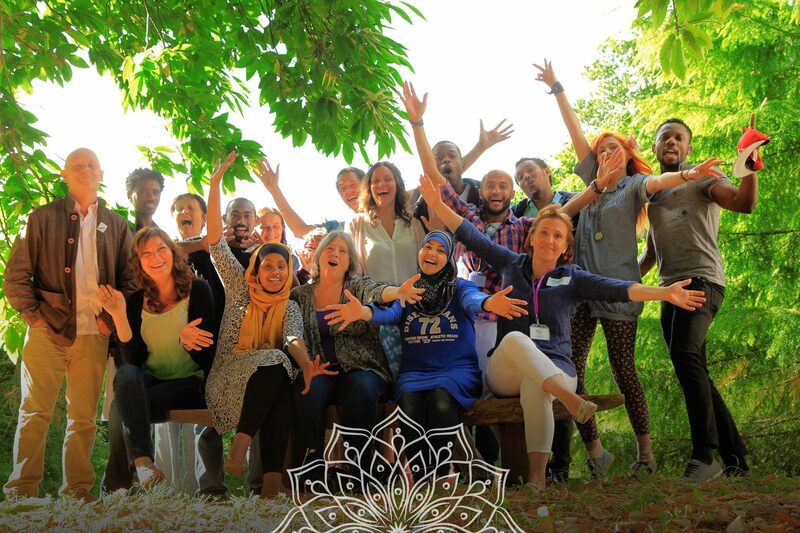 We run this cross-cultural retreat and training in collaboration with our partner Dartington Hall Trust. The residential and retreat format allows people to step out of their stressful lifestyle to explore a kinder aspect of life and have a greater opportunity to deepen their connections with each other. The training will be delivered in the mornings of each days by Jane Silver, language and intercultural trainer. 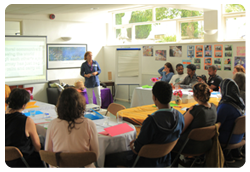 With a maximum capacity of 16 participants, the training is attended by refugees, asylum seekers and other UK residents to help them build intercultural communication skills and social and cultural bridges, so they feel confident enough to startup the early phase of integration and adapt to living and working in the UK. 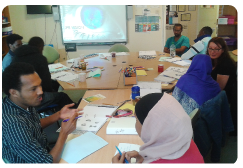 This training is suitable for refugees and asylum seekers who have a reasonable fluency in English and wanting to integrate and start a meaningful life and work experience in the UK. 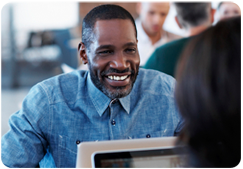 >>> After finishing the training, each participant will receive a one-to-one career coaching to help them create an individualised career plan. 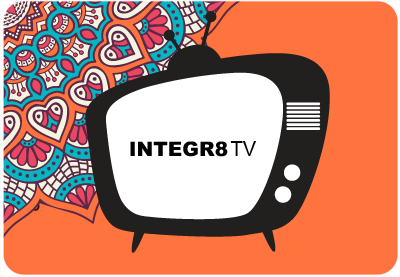 Integr8 TV is a personal development and self-discovery Youtube channel that is dedicated to enrich the lives of people from different cultural backgrounds. The channel addresses both aspects of integration, the inner and the outer, and shares content to help people reach their potential and consciously lead a purposeful life in the UK. Accommodation: The retreat in days 7 & 8 will be a residential weekend. The training starts on 9:15 am on Saturday and finished at 4:30 on Sunday. This means people will stay over night on day 7 where a free accommodation will be provided as part of the programme. The accommodation will be gender specific, means women and men will be staying in separate floors in the building. You can check out accommodation details here. Food & Drinks: There will be vegetarian meals, snacks and drinks available throughout the 4 days, except for dinner on Day7 at Dartington, where people will bring a dish from their own culture to share with others. Gain insight into how to navigate misunderstandings and build social and cultural bridges. Saif Ali is a life coach, community engagement facilitator, public speaker, founder and director of Embracing Refugees, co-founder of Beyond Borders Totnes & District. I have been empowering adults through my Passion2Action programme to help them discover their passions and start doing what brings their purpose to life, beyond their perceived limitations. I have lived a seemingly limiting life for 18 years of it. I fled my home country when I was 17 escaping persecution. While seeking asylum for 18 years, I wasn’t allowed to earn money, and I was living in limbo for that entire period. I was homeless for many years of them which severely affected my health then. 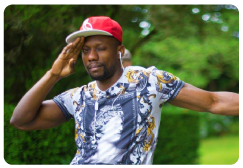 I had to learn how to dance with fear, embrace uncertainty and seek every possibility to connect with the greatness of life and keep my passion and purpose alive. This was the greatest resource of strength I had. I succeeded to create a rich life that was full of possibilities where money wasn’t the centre of it. I studied many courses and kept my skills, talents and learning alive through volunteering in different projects and leading institutes around the UK. All that helped me stay positively engaged in the world and resulted in shaping my current career. I made great connections with inspiring people and kept my eyes and soul connected to a vision of a promising future where I can make a positive difference in the world. This showed me how a shift in the way we see life and ourselves can open our eyes to the vast potential we carry, and how we can shape a new way of embracing life, beyond limitations. Was life challenging at times? Yes. Most of the time. Did it feel endlessly painful? Sure it did. Have I lost hope? MANY times. BUT…. I never lost my passion for doing what I love. Keeping my passion and purpose alive have held my crumbling world together and kept me connected to something bigger than my life challenging circumstances. This is what I mastered and sharing it with and empowering people who are sinking in the same areas I’ve survived became my life mission. Create a mission statement that reflects who you are and your current life mission. To make sure that our service users continue progressing in life and at work we partnered with the Racial Equality Council to run weekly gender-specific peer support groups for men and women in Plymouth. People also get the chance to have one-to-one support from mentors to address specific issues in their life. If you are interested in joining us, please contact Julie or Vanessa on 01752 224555. Secure meaningful volunteering and build work experience by connecting you with volunteer opportunities in your local area. We coordinate this in collaboration with the Plymouth Guild and the Give Back project.
. This helps people overcome cultural isolation and the social marginalization and gives them the opportunity to deepen the connections they established with other UK residents, make new friends and build emotional resilience. BE PART OF OUR EXCITING WORLD! 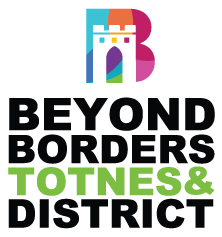 Receive community Support: We work closely with Beyond Borders Totnes & District to meet some of our service users’ individual needs. This varies from offering lifts, befriending, therapeutic support, outings, temporary housing and skill share. 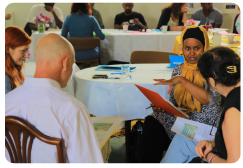 Join local events and activities organised by us or other refugee support agencies to help people stay socially engaged and build cultural bridges. Integr8 is a project designed to set a solid ground for building a strong multi-cultural community in South Devon by empowering and equipping local people, refugees and asylum seekers with the tools needed to integrate through volunteering in local projects and organizations where everyone feels equal and able to embrace cultural diversity and celebrate their identities and strengths. There is a long waiting period (up to 20 years) that asylum seekers undertake from the day they arrive to the UK until they get granted their refugee status. During which they suffer from excruciating social isolation. They are prohibited from getting a paid work and they obviously won’t afford continuing their education and personal development. Many of them lose their sense of direction and get out of touch with their purpose, identities and strengths. They end up struggling with depression, damaged self-esteem and find integrating in the community a massive mountain to climb. This creates a massive gap between refugees and asylum seekers and local people. Apprehension takes over and people feel dehumanized and alienated. Ignoring this issue makes the distance between ‘them’ and ‘us’ gets increasingly bigger and creates a dysfunctional community. If you like to support our mission by offering volunteering opportunities for refugees and asylum seekers, participating in our workshops, offering your professional skills, advice, time or any other resources, please contact us. We will be happy to hear from you. Check out how you too can play a significant part in supporting refugees and asylum seekers. As a refugee, can I come to only one of your weekends, or can I attend several or all of them? We’d love it if you’d like to attend as many as possible. The choice is completely yours to come to just one, or as few or many as you wish. I’ve now received my papers and so now have a ‘leave to remain’. Can I continue to attend your events? Great news, welcome fellow resident! Whilst our service is only for those awaiting a decision from the Home Office, we’d love it if you felt able to volunteer and help refugees still awaiting their decision. Apply to volunteer here. Participate in short, medium or long term projects that helps them integrate in the British community and maintain a sense of purpose. Linking with local projects that are willing to take on refugees and asylum seekers to volunteer over a short or long periods of time. Please keep checking the NEWS & EVENTS or our FACEBOOK page to know about our upcoming activities. If you have any skills or time you can offer to help us achieve any of the above, or you have other ideas that can leverage on it, please CONTACT US! SOUTH DEVON REFUGEE SUPPORT NETWORK (SDRSN) is a collaboration hub of the following several local organizations and initiatives formed to support refugees and asylum seekers in South Devon. 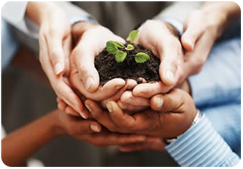 We work in open collaboration with other initiatives in the area. 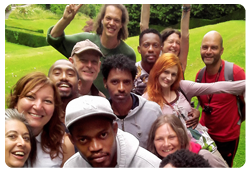 Embracing Refugees: is non-profit community organisation, based in Totnes, that helps local people, asylum seekers and refugees in South Devon to build social bridges through participating in well-being events and activities where they can embrace their differences and celebrate their individuality as part of the integration process. This section will outline advice and guidelines for realistic, needed and careful refugee support – provided by the Red Cross, Refugee Action and other refugee support organisations with great experience of working with asylum seekers and refugees. A recent Home Office report concluded that there was absolutely no evidence to suggest that asylum seekers had a detailed knowledge of UK policies or welfare benefits. So it’s highly doubtful that they’re rubbing their hands together at the thought of potential income support cheques and six-monthly dental check-ups. Fear of being tortured, for instance, would be a bigger reason to leave. The report concluded that the main reasons why some people seek asylum here are their countries’ historic links with good old colonial Britain, the presence of family and friends and the fact that English is a global language. The majority of people coming here as asylum seekers and refugees are currently from the Middle East and Africa. The majority will have experienced difficult and dangerous times in getting to Europe and need time and support in adjusting to a different culture, language and environment. It is common for asylum seekers to wait years and years – 5, 10 even 20 years in extreme cases – until they get a final decision from the Home Office concerning their application. During that time, they are not allowed to work or earn money, and unless they have friends or family members who support them they often live under extremely difficult conditions, with sparse or at times no accommodation or any other resources. They are provided with assigned (not chosen) minimal accommodation (often provided via corporate landlords) – often live in extremely bleak conditions, granted just £35 a week to live on. If they try to earn money they risk immediate cancellation of their application. Often they find themselves living with strangers in crowded, grubby accommodation in a part of town no-one else fancies. It’s not what anyone would really want to call home. Most of us have little grasp of the devastating realities lived that have caused someone to leave everything familiar – and seek a new life far from home. So we need to try and not blunder out of out blindness, limited grasp of what experiences people carry in them. This can involve more listening, pausing, carefulness that we usually deeply in daily life! Err on the safe side, by being careful and attentive. Body language can communicate reticence – on both sides. Acknowledge mistakes, clumsiness and be ready to let go of topics to see if they are taken up again (rather than pursuing the issue just from your own interest). The majority of asylum seekers come from Africa and the Middle East. English language may not be their mother tongue. It is better not to assume everyone can read and write. Some will be highly literate, others will not! Find out how much English is spoken and understood! People coming from African countries in particular, often are fluent in 3 or more languages. So if an interpreter is needed, there may be someone right there who can help!